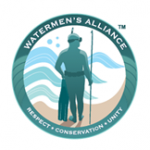 The Watermen’s Alliance (WA) was first started in 2008 as a grass roots movement composed of a small group of spear fishermen and other consumptive watermen to defend our rights of access to the California coastline threatened by the creation of the Marine Life Protection Act (MPLA). The main thesis of the act was, “to protect the ocean, you limit access for fishing.” Being stewards of California’s Oceans and interested in ensuring the preservation of its resources for future generations, a small group of spearo (a common term in the spearfishing community that refers to comsumtive spearfishermen and women) activists became more active in the (MLPA) process for the South Coast Region. Soon, the group grew due to the increasing support of the spearfishing community. In 2009, the Watermen’s Alliance was officially founded. The Watermen’s Alliance is built upon a firm belief in conducting its activities in an ethical manner to achieve the objective of balancing the rights of spear fishermen with respect for the environment. Taking a step back to look at the development of spearfishing, the creation of the Marine Protected Areas (MPA’s), and the Watermen’s Alliance current role in the fishing community gives us a comprehensive understanding of how they are accomplishing their goal today. Spearfishing was born around the Paleolithic era with crude handmade spears and was driven by the instinct to survive. Over the years, spearfishing has evolved from the prehistoric stone tools our ancestors used thousands of years ago, to the modern equipment we use today. With the modernization of the sport came a shift from utilizing spearfishing as a necessity to survive, to a means of harvesting fish in an ethical manner. Unlike other forms of harvesting fish, such as fish farming and commercial fishing, spearfishing has zero by-catch and a minimal impact on the environment. It also empowers people with a choice. A choice to catch the fish on their own, knowing exactly how it was caught and handled before it ended up on their plate, or to take a gamble, and buy from a supermarket where information on the quality of the fish and how it was obtained is printed on a label and taken for gospel. In recent years, unfortunately, the ability for consumers to make this decision has been restricted by the creation of the Marine Life Protection Act (MLPA). In 1999, the California State Legislature passed the MLPA. This required the California Department of Fish and Wildlife to come up with a method of increasing the number of MPAs statewide, where it is unlawful to take or disturb marine life over a period of several years. During this period, many meetings were held to discuss regulations proposed by an appointed team of scientists and regional stakeholder groups. Recreational sportsmen and commercial fishermen often at odds, found themselves on the same side of the table in defense of the rights to fish. Terry Maas and Eric Kett were selected to represent spearos in the 2-year process to establish no-fishing zones. Together they set up regional meetings to explain the act and to solicit help. Soon a core coordinating committee of avid spear fishermen consisting of Terry, Eric, Jeff Sporcich, Iaon Pohlit, Joe Nguyen, Danny Jones and Volker Hoehne began to actively organize opposition to the one-sided process. They realized that if the spearfishing community’s needs were to be met, it needed a voice of its own to ensure spear fishermen were being adequately represented. Since then their reach grew to include clubs such as; Long Beach Neptunes, Northern California Kayak Anglers, Los Angeles Fathomiers, Monterey Tritons, Northern California Skin Divers, OC Spearos , San Diego Freedivers, Santa Barbara Freedivers, Northern California Underwater Hunters, and Sonoma County Abalone Network. After a long and hard fought crusade, despite the combined efforts of the spearfishing communities, not all of their objectives were achieved. However, there were several victories for the spearfishing community. Terry and Eric convinced the MLPA staff to designate white seabass and yellowtail as pelagic fish, “not likely to benefit from a marine reserve”, which mainly benefits year-round inhabitants. Additionally, they convinced the MPLA delegates spearos were so selective in their take, they could be allowed to hunt some marine reserves to the exclusion of all other consumptive fishers. This opened up Swami’s State Marine Conservation Area (SCMA), Farnsworth Bank at Catalina and Naples Reef in Santa Barbara to spearos. These precedents will be valuable in future negotiations. While they were able to preserve many of our favorite areas, including most of Catalina, big losses were Laguna Beach and Malibu. As the Watermen’s Alliance matured, they assisted Northern California divers in their negotiations and they participated actively in a legal action to overturn or modify the MLPA results. Though the MLPA process has drawn to a close, the Watermen’s Alliance has learned a great deal from participating in the MLPA process and grown stronger from the experience. The Watermen’s Alliance is applying what it has learned and is working hard to move forward and stay current on fishery regulation issues for the protection of spear fishermen across the state, working on such issues as lobster and abalone regulations. Recently they advanced the cause to allow spearfishing for striped bass, which opened up much of the state to us including the American River. In addition to the ongoing fight to protect our fisheries, the Watermen’s Alliance ensures it takes time to recognize California’s Wildlife Officers for the importance they play in ensuring our resources are protected through the Wildlife Officer of the Year program. The program was created by the Watermen’s Alliance to show its appreciation for the hard work these individuals put in every year. Spear fishermen are given an opportunity to vote for a Fish and Wildlife Officer who they feel has done an exceptional job enforcing California’s regulations in a professional and courteous manner. After a Wildlife Officer is selected, the Watermen’s Alliance gives a donation on behalf of the Officer to a charity or organization of the officer’s choice. On top of the Officer of the Year Program, the Watermen’s Alliance actively reaches out to the spearfishing community through its liaisons with officers of local spearfishing clubs, and its website, to keep the spear fishermen informed of important changes and how they can get involved. Communicating with the spearfishing community is of the utmost importance to the Watermen’s Alliance as the strength and effectiveness of the organization depends upon this. With the support of the spearfishing community and the improvement of relations with the F&G Commission, the Watermen’s Alliance is certain an effective and fair solution to the protection of our ocean’s resources for future generations can be achieved.